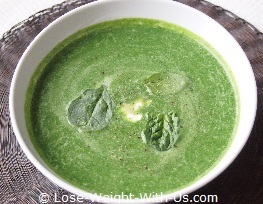 This spinach soup recipe is one of my favorite, not only because it is delicious and easy to cook but also because it is good for you as it is packed with nutrients - one serving provides: vitamin A 113%, vitamin C 77%, folate 37%, manganese 34% of our daily value (DV). 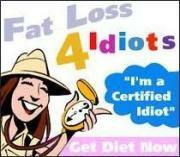 It is very low in calories (109 kcal) and carbs (4g net carbs). This gourmet spinach soup can be served hot as well as cold. Recipe Nutritional Profile: Diabetes Appropriate, Healthy Weight, Healthy Heart, High Fiber, Low Calories, Low Carbs, Low Cholesterol, Low GI, Low Fat, Low Sodium, Gluten Free, Vegetarian, Good Source of: Vitamin A, Vitamin C, Folate and Manganese. 600 ml of vegetable stock prepared with 2 tsp. of bouillon powder (vegetable stock for soups). 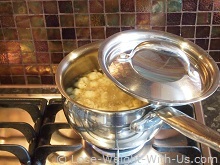 To cook the soup we need a small to medium saucepan with a lid, a large frying pan and a blender. Heat 2 tsp. of olive oil over a medium heat in a saucepan, throw the chopped onion in and saute until soft and the onion starts changing color - about 3 min. Add the garlic and nutmeg and saute until the aroma is released for half a minute or so. 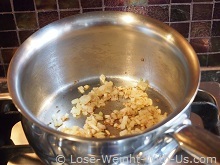 Pour in the vegetable stock, add chopped cauliflower, bring to the boil covered with a lid, then reduce the heat and simmer for 10 min. When done, let it cool down for about 10 min before transferring it to the blender. You need to make sure it is not too hot so it does not crack the glass on the blender. 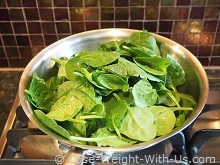 Meanwhile, thoroughly wash the spinach under a cold running tap. 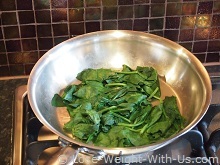 Put the spinach in a large frying pan over a high heat, steam for 2 min constantly mixing with a spatula. The spinach will wilt and shrink. Puree the spinach, cauliflower and broth in the blender. If the soup is hot enough to eat you can dish up straight away. If it is not hot enough return to the pot and warm through on a low heat. Alternatively, you can cool the soup down if you are after a cold spinach soup. Finish the dish with sour cream and freshly ground black pepper.